Customer feedback comes in many different forms. Often sought out by companies, it can be captured via email, web pop up or telephone surveys. It can be recorded in face to face customer focus groups or received in person before, during or after an interaction with a customer. Some still leave good old-fashioned paper forms for customers to fill in, whilst new-fangled QR codes attempt to entice consumers to use modern technology to tell companies what they think. It is no big secret that the newest form of customer feedback’ is of the unsolicited kind. This is feedback that is not necessarily asked for, yet can potentially have the most significant effect on the companies it relates to. This is the feedback that is being produced on a daily basis across social media platforms such as Facebook and Twitter. Despite the fact they have been in existence for a while, companies are still struggling to adapt to their very existence. On a regular basis, social media customer experience horror stories are being exposed – in this blog post I will be sharing two of them from the airline industry. Companies cannot hide from the fact that Twitter is a hugely important vehicle for BOTH customers and their own businesses. Customers (whether existing or potential) use twitter as a way of stating a number of things. They use it to praise companies and their employees. They use it to ask companies specific questions and to ask for help. They use it to make complaints requiring a response. They also use it to express their dissatisfaction with companies who do things they do not like. In all cases, the insight that can and is being captured via Twitter is an invaluable feed into an organisations customer feedback engine room. The beauty of Twitter and other social media platforms is that the feedback being placed on them is completely free and unprompted. There is no bias. There is no skewing of data. Customers will say what they will whenever they want to say it. It is therefore VITAL for an organisation to know what to do with the feedback they capture – how to deal with it when it comes in. Twitter is just ONE of many sources of customer feedback – the key is to ensure that all forms of feedback are linked together in someway to ensure that the strategy for dealing with it is in context with the priorities for improvement in the end to end customer experience. Feedback is a gift – but you need to know how to accept it and what to do with it. Two organisations who have recently failed to deal well with Twitter feedback are both from the airline industry. Let us start with Southwest Airlines. When a good friend of mine brought this story to my attention, I was disbelieving. I had to check the date to make sure it was not April Fools Day. Sadly the story is not a joke. It is very real. It is one of the most amazing stories of the mistreatment of customer feedback I have seen to date. The story is about a frequent Southwest Airlines passenger called Duff Watson. Usually flying with the airline on business, Mr Watson was on this occasion travelling with his two children. Being a frequent passenger, Mr Watson benefitted from priority boarding. Although his two children did not have priority boarding tickets, he did not think it would be a problem for them to stand in the queue with him. To cut a long story short, Mr Watson was flatly refused entry to the plane via the priority boarding queue. As many consumers would, whilst making his way to the back of the normal queue with his children, Mr Watson tweeted his dissatisfaction at the way he had been treated. What happened next is quite simply amazing. Having taken their seats on the plane, Mr Watson and his children were told to leave the aircraft immediately. When back at the gate, he was told that his tweet of dissatisfaction constituted a ‘safety threat’. The only way he would be allowed back on the plane would be for him to delete the tweet. With two distressed children, Mr Watson did this – waiting until he arrived at his final destination to tweet the airline again. Quite a remarkable story – you can read more about it here. As a result of this tweet, Mr Leiser was allegedly threatened with not being allowed to board the aircraft. Told he was not allowed to tweet ‘stuff like that’, he was genuinely at risk of being refused access to the plane. Astonishing. Eventually Mr Leiser did board the plane, but like Mr Watson before him, the story of the way he was treated will rumble on long after his flight ended. You can read more about this story here. In both cases, valuable repeat customers of two airlines used their democratic right to leave ‘feedback’ about companies they were interacting with. In both cases, the actions of the companies were wildly inappropriate. Rather than trying to prevent customers from saying what they think, these organisations should be LISTENING to vitally important feedback that identifies weaknesses in their ability to deal with certain scenarios. Rather than defending the actions of employees who have clearly not be trained to deal with these situations, Southwest Airlines and Easyjet should be giving unreserved apologies to Mr Watson and Mr Leiser and reassuring customers that they welcome feedback in the quest to continually improve their customer experience. I hope I will not read more stories like this in the future – sadly I expect I will. I was told a long time ago that feedback is a gift. I thought that was a very wise statement. Receiving the gift is easy – knowing what to do with it is the hard bit. Money Makes the World Go Around…No It Doesn’t – People Do! As soon as I saw it my heart started to beat a little faster. I did not even realize it, but my hands had formed into fists. I was genuinely incensed by a few simple words in an ad shared on a social media platform. If you are not sure why I became so angry, you have the potential to be taken off my Christmas card list! You also need to keep reading to understand why! As someone who spends a lot of time helping organizations across a wide range of industries become more customer centric, I see a lot of different attitudes towards people. There is no doubt that “people” rarely come at the top of the list of priorities for organizations and that is true all around the world. Despite the fact that no organization anywhere on earth can deliver their customer experiences without them, it is very uncommon to find even a reference to “people” in a business strategy. If you have not heard this quote before, take a second to read it again; it is so very true. While boards of directors are conjuring up plans to increase revenue or maximize profits while appeasing shareholders, they have forgotten that it is not money that makes the world go ‘round. The best way to give everyone the things they want is to put people at the center of everything you do – and by people I mean customers and colleagues. The most successful organizations in the world are ones where people quite literally make their organizations dance and sing. From Zappos to John Lewis to Ritz Carlton to Disney, organizations that care about their people deliver experiences that customers perceive to be that much better. I have visited companies whose people have never seen a director before. Their people are like battery hens in cages – fulfilling tasks, but almost without the lights on. It is no surprise that customer perception of the experience these people deliver has been poor. Have you ever tried rolling out your customer feedback survey with your own people? For example, have you asked your own people if they would recommend your business to others? If not, you should consider doing so…you might be surprised by the responses. I recently did this with a large SME business in the UK. The business had a negative Net Promoter Score. When we ran the survey with their employees, the score was significantly worse than it had been with their customers. In other words, their own employees were even less inclined to recommend the business than their customers. These same employees were talking to customers every day – many of them in a sales capacity. If your own people do not like you, why should your customers? I hope the company who ran the ad on LinkedIn reads this post. I hope they take heed of the message within it. People are the greatest resource any organization can have – above and beyond any system or product. Without people, you do not have a customer experience. People are not machines. They are valuable deliverers of your customer experience. They are passionate colleagues who need to be engaged in what you do and why you do it to the point where they are your greatest advocates. Understanding what makes them tick will make it easier for you to design and deliver an employee experience that makes their advocacy a reality. That is why I got so angry when I first read the ad. People are rather important in the world of customer experience. It is people who make the world go around…and I will do whatever it takes to help organizations understand that fact! I originally wrote this post for InsideCXM – InsideCXM is focused on bringing you the latest insights from the field of customer experience management (CXM). CXM is about using customer insights to create meaningful experiences — regardless of how or where customers engage with your brand, online or off — which help create satisfied, loyal brand advocates and ambassadors. You can read more fantastic articles from other CX experts here. I will be writing another exclusive article for InsideCXM very soon. The bursting of the Tesco bubble. When it comes to Customer Experience, bigger does not necessarily mean better! Being blunt, Tesco have done what every retailer should have done – they have given millions of British consumers ‘what they wanted’ – QUALITY, CHOICE, FLEXIBILITY, RELIABILITY and CONVENIENCE. Tesco successfully identified that we wanted our weekly shopping experience to be easier, without the hassle. If they could create a proposition that not only allowed mum and dad to get their baked beans, but also pick up the school uniform for the new term at the same time, most mums and dads would be happy with that. And we were……are. However many disagree with my point of view (as of course they are entitled to do). Apart from their apparent disregard for independent retailers, Tesco’s financial fortunes have been on the wane for the last three years. My friend and fellow blogger, Helen Dewdney (or the Complaining Cow as she is better known), has not been a fan of Tesco for a long time – or more specifically she has not been a fan of their CEO – Phillip Clarke. Helen, who is an expert in the field of Complaints, believes that Tesco and Phillip Clarke are guilty of not listening to customers. Helen believes it is this failure to listen that has led to Tesco’s current predicament and the announcement of Phillip Clarke’s departure in October. You can read Helen’s point of view here. Whatever way you look at it, Tesco is a hugely successful business. Employing over 500,000 people in 12 markets, it still is a hugely successful business serving 75 million shopping trips every single week – that is a lot of customer experiences! After years of unrivalled ‘double digit’ growth, Tesco’s sales have been in decline ever since Mr Clarke took over the leadership reigns from Sir Terry Leahy. You could say failure was inevitable – akin to David Moyes succeeding Sir Alex Fergusson at Manchester United, how could anyone take over from where Sir Terry left off? One of the things that has always fascinated me about the largest companies in many sectors is that they are always obsessed with getting bigger. Never being satisfied with simply sustaining their business, the ever challenging demands of shareholders have meant that big is never big enough. Year after year revenues are expected to rise – failure to do so often results in the fate that Mr Clarke has now experienced – the exit door for the man or woman at the top. Growth comes in multiple ways – expansion, acquisition and diversification in the main. Tesco have shown deftness at all of them. When Jack Cohen opened his market stall in 1919, he would not have imagined his business selling anything from bananas to mobile phones to house insurance in the UK, Hungary and China among others. With stores of all shapes and sizes and now multi national as well, Tesco is a conglomerate with a variety of different business interests. Throughout all of this growth, Tesco have been as customer focussed as any of their competitors (in my opinion). As I said in my 2012 blog – their growth has been achieved as they have consistently given consumers what they demanded. I am all for organisations having a clear vision supported by values, but only if they are understood and acted on. Helen Dewdney’s post strongly suggests that these are just ‘nice words’ and not a reality at all. The thousands of people all over the country who have protested at Tesco’s continuing desire to open more and more stores on the UK’s high streets will no doubt refute the ‘acting responsibly for our communities’ value. Yet the biggest mistake of all appears to be the first one – ‘understanding our customers’. I am not sure that Tesco can honestly say that they have understood and acted upon the changing needs of the consumer. In 2014, the British consumer still wants QUALITY, CHOICE, FLEXIBILITY, RELIABILITY and CONVENIENCE – but he/she also wants these things to be at the best VALUE FOR MONEY. In its quest for more, Tesco has lost sight of just exactly what Tesco is. In the same way that Marks & Spencer struggle to let the poor old consumer know what it is, Tesco has fallen in to the same trap. It is no longer clear who Tesco are competing with. Is it Sainsburys, Morrisons and Asda, or is it Waitrose? Are we supposed to select Tesco ahead of Aldi and Lidl? Are Tesco Mobile better than Vodafone, O2 and EE? It seems to me that in their obsession with the numbers, Tesco have FAILED to adjust to the changing needs and behaviours of the consumers they did so well to nurture. I remember at University, listening to a lecture about business diversification. Whilst I cannot remember the specifics, I will never forget the lecturer teaching my classmates and I about the risks of businesses trying to diversify into interests that are not core to its proposition. Taking your eye of the ball of your core business is a very real issue – something that may have led to Tesco’s current plight. Tesco desperately need to decide what it is again. Why should the British consumer spend their hard-earned money with Tesco as opposed to the plethora of competitors who are stealing customers away? The Golding family used to shop at Tesco. We do so no longer. Why? Quality is not what it used to be. Although Choice, Flexibility and Convenience are all still good, Tesco is no longer good Value for Money. Why shop at Tesco when you can get the same (if not better) quality with far better value at Aldi? Tesco, like M&S, high street banks and utility companies need to work hard to convince us to understand not just who they are, but to trust them again. Being the biggest may please the shareholders, but it does not necessarily mean that you will deliver the best experiences. Being biggest does not mean you will be able to continue giving customers what they need or want. Dave Lewis, the incoming CEO of Tesco will need to work hard to convince his organisation that the best way to take the company forward……I would argue the only way……is to start putting customers interests before shareholders demands. While the company continues with its obsession to just get bigger, they will continue to drive customers away. If Tesco want to be true to their values, start to listen and understand what customers want – and design the future experience accordingly. This will take time – but it will ensure both the sustainability of the business and long-term returns for investors. Acknowledge, Apologise, Address – the 3 A’s of dealing with mistakes! I have sometimes been accused of intentionally looking for the bad things that organisations do to customers. Whilst it is true to say that I often describe experiences that are a long way from meeting customer expectation, I never actively seek out the negative. If I am guilty of anything, it is of reporting the truth – the truth as I see it and the truth that I personally experience. Much of what I write about is extremely positive, yet I and others continue to encounter negative experiences too often. Negative customer experiences are the effect of a plethora of causes. Broken processes; ineffective behaviour; weak leadership; inappropriate organisational culture; poorly designed customer journeys; are all amongst the most commonly occurring. However some negative experiences occur for one simple reason – someone made a mistake. Mistakes happen – we have all at sometime made one. I guarantee that every one of you reading this blog post have one mammoth mistake story that you can recount around the dinner table. At the weekend we had lunch with friends. Mrs C (I will obviously not reveal who Mrs C is) once used to work in the HR function of a large organisation. She accidentally shared with a group of colleagues the plan to dismiss a number of underperforming people – she realised just a little too late that the people she was sharing the plan with WERE the underperforming people themselves! She was mortified – as were the poor people affected. Mrs C had made a mistake. Mrs C never made the same mistake again! People will never be immune from making mistakes, nor will the organisations they work for. However robust your business processes; however much you try to ‘mistake proof’ the things your business does; mistakes will happen. In the world of Customer Experience, they absolute key is for an organisation to know how to deal with mistakes – and to deal with them so well, that they are still able to maintain and sustain their relationship with valuable customers. Like every one of you, I have made my fair share of mistakes. Sometimes my mistakes are as simple as using the wrong name in an email – only yesterday I sent an email to a lady called Susan – I had ‘copied and pasted’ an email that I had already sent to a man called Greg. You guessed it….I forgot to change the name I was addressing the email to from Greg to Susan! It happens! Whilst it is incredibly annoying for the mistake maker, it is not very nice for the recipient either. That is why I believe that we should all consider having a method for dealing with mistakes. The method that I use can be summarised as the 3 A’s – Acknowledge, Apologise and Address. In the case of my email to Susan/Greg, I was told of my mistake by another colleague. Having muttered an expletive to myself, I immediately sent Susan an email acknowledging the mistake. In my email I apologised and explained what had happened. Fortunately for me, Susan was very forgiving as a result. I like to think it was my act of Acknowledging, Apologising and Addressing that enable her to forgive so easily. A few weeks ago, I was party to a far graver mistake. This was a mistake that made me feel physically sick – we have all been there. I would like to share this story with you as a way of explaining my 3 A’s principle. Custerian were to hold our first Customer Experience seminar in London. Having decided upon a date, we agreed our marketing strategy. In addition to publicising the event across all of our social media networks, we decided that we would send an email to as many of our contacts as possible. Having created the wording of the email and inserted a web link to the registration page for the event, the email addresses were inserted into the email. This is where the rather serious error occurred. Instead of ‘blind copying’ the email to all recipients, the email was mistakenly sent to well over a thousand people with all email addresses clearly visible. I was not immediately aware of the error. It was only when I received an email from a contact who can only be described as ‘livid’, that I realised a mistake had been made. I was horrified. My heart rate climbed very quickly – I started to sweat profusely. Within thirty minutes of the email being sent, I received a dozen emails back from disgruntled recipients. Having taken stock, I needed to act – and fast. My first act was to create an email response to everyone who had received the original. In my response (which was ‘blind copied’ to all!!) my opening words were those of an acknowledgement of the mistake. I think it is imperative when a mistake has been made to be open and honest about it – do not try to defend your actions. Do not try to blame someone else. A mistake had been made and it was important I acknowledged it. My second act was to apologise. Whether people had noticed the mistake or not, it was vital that I openly apologised for making an error. What had happened was unacceptable and I needed to show genuine empathy for those who felt negatively affected by my actions. Some told me not to worry – others said that they were not even clear what the issue was. However I knew that some people were really not happy, and so it was critical to ensure they could see my genuine apology. My third action was to address the issue. The mistake was made because I failed to ensure that the process we followed was robust. Prior to the email being sent out, I had failed to check that everything was all ship-shape. I will never make the same mistake again. I also needed to reassure all recipients of the rogue email that not only would I ensure it would not happen again, but that they also had the option to go a step further. I made the offer to everyone who received the email to be removed from our contact lists – to give them the assurance that they could not receive another contact from me if that is what they wanted. My actions led to a significant minority of people asking to be ‘removed from my contact lists’ – that is regrettable. The significant majority however were very quick to get in touch with me. They did not get in touch to berate me – quite the contrary. Dozens of people in my networks got in touch to thank me for my actions. They emailed me to say how I needn’t worry. Many wanted to make sure that they were never removed from my contact lists. You may think that I being a little over the top here, but their emails made me a little emotional. I believe that my principle of Acknowledging, Apologising and Addressing had made my network even stronger. My ‘customers’ became even more connected with me as a result. The small number of people who chose not to ‘forgive’ the mistake may not have been the ideal connections for me in the end. I will undoubtedly make mistakes again in the future. If that happens, I will set my 3 A’s principle in motion once more. As people we know that others make mistakes and we appreciate it when they admit it. We feel better when we receive an apology for the mistakes that are made and reassured when the mistake maker does something to address the mistake. Too many businesses do not apply these principles when conducting business. They defend, divert and refute anything that can be perceived as a weakness. All this does is to serve to alienate customers. I hope that businesses can learn something from the 3 A’s principle and start to see the benefits of dealing with mistakes in an open, honest, genuine and empathetic way. I am delighted to introduce a new guest blogger this week – Tim Dixon-Phillip, Director of Service Reality. In his post, Tim talks about the term ‘Profit Leakage’ – as you take the time to read it, you will recognise where many organisations are experiencing it!! I hope you enjoy the post as much as I did. Increasingly, buyers of business or professional services expect more for less. Tough economic conditions, increased promiscuity and aggressive new market entrants with deep pockets and marketing savvy have permanently changed the rules of new client engagement. The following article draws on mystery shopping evidence from professional and business services providers which reveal three of the most common leaks in the new enquiry pipeline which are impacting enquiry conversions, profits and returns on marketing investment. For ease of reference, clients and customers will be referred to collectively as customers. Profit leakage usually occurs following a mediocre or poor experience which causes a prospective customer to hesitate and/or go elsewhere. This can happen at any point of interaction in the new enquiry journey, from visiting the website, talking to the switchboard/call centre through to the initial consultation with an adviser. A growing number of business and professional service providers see benefit in measuring what happens to prospective or existing customers when they start a dialogue with people at various levels in the company, either to get something done or in response to a referral or a marketing event. Some of the companies that have adopted this approach have witnessed an exponential impact on profit, revenues and customer retention as a result. Conversely, companies are learning that a negative customer experience is punished more severely than ever before and even dissatisfied business customers are increasingly likely to broadcast their complaints on social media. Service companies are finding that the unique way in which they deliver their own version of a great customer experience is something that differentiates their brand. It is also something that is very difficult for competitors to mimic. Retail and Leisure brands have known this for years, which explains why the global annual mystery shopping spend in these sectors is estimated to be $3 billion. How does your company measure what it feels like for a potential or existing customer when they use your website, switchboard or call centre? Do you know what impression your partners or account managers create during an initial telephone consultation with a prospective customer? Which member of your senior management team is accountable for improving end-to-end customer experience across the company? The biggest influence on customer loyalty and buying behaviour will probably always be the quality of the advice and strength of their relationship with your front line relationship managers. However, the rules of engagement have changed. Customers have learned to expect more. They are more discerning and less tolerant than they ever have been. Relationship strength and the customers’ propensity to buy is increasingly influenced by their overall experience of using your company. During a recent project with a top 50 law firm, we audited what it felt like for customers to make a new enquiry from start to finish. We quickly identified that they were leaking profit in several key points of interaction between customer and firm. We tested a variety of customer personas (business and personal) and simulated a number of evaluation and enquiry journeys. We tested the performance of the website, and taped the subsequent conversations with switchboard, support teams and fee earners. It was easy to see the points at which they were losing potential customers and where they were giving new and existing customers a negative impression of the brand. It was also easy to see where new enquiries were tying up fee earners with non-productive conversations due to poor filtering at the front end of the new enquiry process. The impact of this project was immediately noticed by partners and staff. The evidence (good and bad) generated by the audit was irrefutable and emotive, which proved to be a powerful catalyst for change. Our client was able to galvanize teams into action and unite partners in a way they hadn’t seen happen before. New enquiry conversion rates doubled across the firm within 6 months. I have attended countless number of workshops, briefings, seminars, masterclasses and conferences over the last 19 years. During that time I have had the pleasure (most of the time) of attending these events at locations all over the world – from St Louis to Singapore – from Munich to Manchester. More often than not I have experienced the delights of a windowless hotel meeting room with only lukewarm watery coffee to look forward to during a break. For a long time hotels have been seen as the best option for organisations needing to hold a meeting that is either too large or inappropriate to have in their own offices. Specialist conference centres exist, but I am yet to visit one where the experience has felt any different to the blandness of a hotel…..that is until yesterday. On the 8th July 2014, I ran a Customer Experience seminar at Wallacespace in Covent Garden, London – and it is the experience that I had that is the subject of this review. Offsite meeting space is what we do and it’s all we do. Our spaces in Covent Garden, St Pancras and Clerkenwell Green are designed for meetings, training, research, events, conferences, workshops… our rooms are a blank canvas for you to use as creatively as you like. We won’t hide you away in a dingy basement while we focus on something or someone else. Originally coming from a training background ourselves, we aim to think of everything to ensure that you will get more from your day at wallacespace than you would anywhere else. Flooded with natural daylight and with all the little touches that make for a great day (from super-fast free wifi to all-you-can-eat wagon wheels), our buildings are designed to help facilitate creative thinking and minimise distractions, while our people aim to think of absolutely everything with a refreshing, ‘can-do, will-do’ attitude to ensure you can focus on delivering success. In the world of Customer Experience, where an organisation makes statements like those above, they constitute a promise or series of promises. When you read something like this, you immediately have the expectation that the words are a direct representation of the experience you will have. The question is…..does the experience match the promise? Read on to find out. Accessibility – CX Review Score 9/10 In my review process, the definition of accessibility is ‘how easy was it for me to do what I wanted to do’ with the organisation I have chosen to transact with. I have awarded Wallacespace 9 out of 10 for this category – almost perfection! From the minute you start to engage with this organisation, you get the sense that your experience is going to be a good one. With three locations in London (Covent Garden, St Pancras and Clerkenwell Green), all of their ‘spaces’ are easily accessible in our capital city. I have to admit that I cannot take the credit for selecting Wallacespace in Covent Garden to be the location for a Custerian Customer Experience Seminar this week – that must go to my esteemed colleague Jerry Angrave. Jerry was supremely confident that I would be impressed – and confident he was right to be. The booking process was easy and hassle free. Wallacespace were happy to accommodate our every whim. Our delegate numbers went up and down. Our room requirements changed more than a few times – but nothing was a problem. We were even given the option to ‘choose our room’ on the day if we felt the space that had been selected for us was not to our liking. Within easy reach of a multitude of tube stations, Wallacespace Covent Garden is a stones throw from shops, cafes and theatres. I usually arrive VERY early at the location where I am going to be delivering training – yesterday was no different. Usually I am either refused entry, met with a locked door, or greeted by a space with no staff, no lights and sometimes no tables and chairs!! As Jerry and I approached the front door of the building 20 minutes before it was due to open, I suspected that we would be out of luck. How wrong my cynicism turned out to be. A lovely, smiling lady came to the door and let us in – she did not even bat an eyelid that we were too early. It drives me nuts when companies will not open the door until the millisecond stipulated by their opening hours. This made for such a refreshing change. As she led us through the reception area, I could not help noticing some pictures on a shelf. The pictures were of the Wallacespace staff – a lovely touch: Walking over the bright green floor, you can immediately tell that you are in a space designed to deliver a memorable experience. Brightly coloured furniture, high ceilings, light airy rooms – I was smiling already. The Plum Room that had been selected for us was lovely. Although the room was ready for us, it was not quite as we had asked for. Despite this, the Wallacespace staff were completely unfazed by our demands for unnecessary tables and chairs to be replaced by some comfy furniture. Sofas, armchairs and even a nice green rug were brought into the room without any bother or fuss. Every detail has been considered. Facilities in the meetings rooms are excellent – paper, pads, post its, marker pens and more flip charts than you can physically use. It is obvious that the people who created these spaces have used the spaces themselves. Everywhere you looked there was something else to see. Directly outside the plum room was a fridge – stocked to the brim full of drinks – from green tea cocktails to sparkling water to energy drinks. Once you walk through the front door of the building, all of this is included in the price. I did not think it could get any better than this….but it did. On the top floor is the Wallacespace café – as I climbed the stairs, the waft of breakfast odours started to fill my nostrils. With a breakfast selection to rival any hotel, the conservatory like café is wonderful. Everywhere you look there is something else to see – from huge jars of sweets on one table to a wonderful range of tea and coffee on another. At Wallacespace, whatever you want, they are likely to have. I regularly bemoan organisations of not paying enough attention to the little details – Wallacespace cannot be accused of this. Even the toilet facilities impress. Forgotten to apply your deodorant this morning? At Wallacespace they can solve that problem!! So why only 9 out of 10? It may sound like nitpicking, but to have achieved perfection, Wallacespace would have got the room layout right the first time. I would also love to see Wallacespace with more spaces accessible outside of London. However, a score of 9 out of 10 for accessibility is VERY VERY good – this is a very impressive company. Range/Choice – CX Review Score 9/10 Rooms of all shapes and sizes at Wallacespace locations. All of them are decorated beautifully and can be filled with the furniture of your choice. The spaces are not quite big enough for conferences – the largest on offer can accommodate 120 people (theatre style) in St Pancras. However, if you require a space to hold a meeting; run a training course or deliver a workshop, it is very likely that Wallacespace will have exactly what you are looking for. People – CX Review Score 9/10 Wallacespaces people are lovely. Nice, polite, friendly with a no nonsense attitude. They are as their promise states. They will do anything you want them to do without any fuss. Sadly I cannot remember the names of the people who served and supported us throughout the day. It would have been nice for there to be a little more of the personal touch in the way they tended to us. I suspect that their intention is to provide service that is not intrusive. However, I would have liked to know which member of staff corresponded to the baby pictures in reception! Value – CX Review Score 8/10 You will not have failed to notice that I have already become a fan of Wallacespace. However, the delights I have depicted do come at a price. Wallacespace is not cheap – we paid £88 a head for our event. There is absolutely no doubt that we could have found a cheaper location. This category is not specifically about price though – it is about value. We wanted our delegates to have an experience – not just in the delivery of the seminar, but with the whole experience. For a company running a seminar, the location they are running it from is a key touchpoint. We thought very carefully about that. Our delegates were VERY impressed. They loved Wallacespace as much as we did. We are delighted that they will remember a number of things about their experience with us – one of those will most definitely be Wallacespace. So I think we did get great value for money – but if you are on a budget, Wallacespace may be out of your reach. How did it make me feel? CX Review Score 10/10 In a word – fantastic. Let me remind you of the fact that this is the best location I have ever had the pleasure of attending or delivering a workshop from in 19 years. If you are a trainer yourself, you will LOVE it. If you are a delegate you will LOVE it. This business has nailed all three elements that make customer experiences. It does exactly what you want it to do (FUNCTIONAL); they make it very easy and hassle free to do what you want to do (ACCESSIBLE); and you will feel as though you have flown business class to New York at the end of it (EMOTIONAL). They brilliantly meet their promises and deliver an experience that does not just meet your expectation, it exceeds it. Would I use them again? Yes YES, YES, YES, YES, YES. Wallacespace will be seeing a lot more of me and Custerian. I would not be surprised if they see more our the delegates who attended our seminar yesterday. I will also be telling a lot of people about them. This is the effect of a customer having a great experience. Wallacespace are doing what they doing brilliantly. All I ask is that they think about creating more spaces outside London and soon. If they could stretch to creating one in Chester, that would be the icing on the cake!! Every week friends and family share stories with me. The stories are a reflection of what is happening in the real world – the world we all live in as consumers and customers. Whilst many of the stories are positive reflections of people doing great things, more often than not, the story is one that would make the most prolific author of fiction get excited – they are almost that unbelievable! This week I am delighted that Kirsty Scott, a fellow Customer Experience Professional has agreed to share this with all of us. Written quite brilliantly, Kirsty describes the horrific experience her Mother went through to purchase a new dishwasher. Something that should have been so simple turned in to a shocking demonstration of missed opportunities. 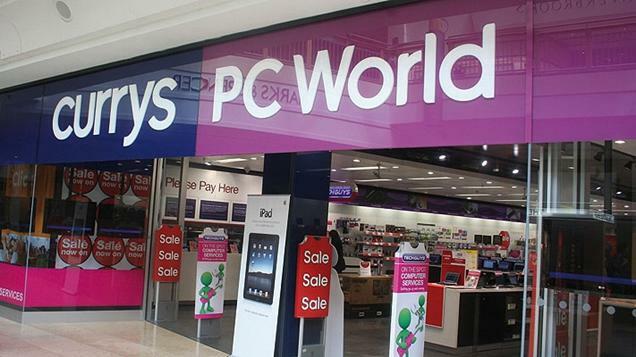 The company that is the subject of the story is Currys PC World. Having read it, you may be interested in reading the Customer Experience Review I wrote about Currys PC World recently – you can do so here. We can all learn from what you are about to read – I hope you enjoy it as much as I did…. My lovely, little mother recently purchased a new dishwasher. Her previous machine had given many years of faithful service but eventually succumbed to a critical fault on its mother board (I don’t know what that means, but it sounds painful). So, Mother Dearest toddled off out for a wander one Friday afternoon and found herself in a retail park where there was a Currys. Having previously run into problems with Currys regarding an oven that she’d purchased and paid to have delivered and installed, when it turned out that the chaps who delivered it couldn’t install it, she went against previous experience and decided to pop in and look at dishwashers and maybe give this familiar High Street brand another chance. A dishwasher was found, an order placed and next day delivery and installation service paid for. Here is where the problems began. The dishwasher was duly delivered the following day, on a Saturday and the men from Know How took the old one out, tried to disconnect the pipes from the water source and found the valves had seized. They downed tools, announced it was ‘not their job’ to fix the valves and left. No dishwasher installed, no old dishwasher removed and one very disappointed customer. Own the issue! If it’s simple, fix it! “Not my job” and sloping shoulders push the effort back on the customer. They may have a tight delivery schedule, but what’s the real cost of spending 20 minutes fixing something vs having to return another day to reattempt delivery? I suspect there will be an ROI on that extra 20 minutes, not least in future sales from a happier customer, but also in cutting wasted repeat journeys. Back to Mother Dearest. Clearly, there wasn’t very much ‘installing’ going on. The Deliver and Install service is an optional extra which customers can opt to pay for and they also take your old machine away, which saves you a trip to the tip; marvellous, if you’re a little, old lady (reader beware: little, old ladies can be dangerous when riled!). Mother called the plumber. He arrived the following Monday and fitted a new valve in a matter of minutes, all the while grumbling about how these ‘deliver and install’ guys make easy money, don’t do any of the vaguely difficult jobs and charge a fortune for the service. Mother was inclined to agree. She called Currys back and asked for a new appointment to ‘install’ the dishwasher, as it was now sat in the garage awaiting attention. The following day, with no appointment (they just seem to turn up whenever they get around to you), a second attempt was made to install the machine. Give customers a firm time or at least a 2 hour window in which you’ll deliver – it can’t be that hard to figure out once you’ve got the route planned and will massively reduce perceived customer effort. Sitting in all day doesn’t take a lot of effort, but it is a real pain in the proverbial, and if you’re a customer, isn’t that the same thing? Said installation chaps arrived, let’s call them Laurel and Hardy. They removed the old dishwasher and plugged in the new one. Mother was told at point of sale that the delivery would entail a 15 minute run of the machine to make sure it worked and didn’t leak. Laurel plugged in the machine and set it to run for a 15 minute pre rinse cycle. The duo made a move to leave, were questioned about making sure it worked and responded with “Oh, it’ll be fine, it’s a new machine.”…. I think you know where I’m going with this. If you make a promise, KEEP IT. Simple! The service states they’ll check the machine. They should check the machine. Laurel and Hardy hot footed it to the van and left the scene with a speed that made Mother Dearest wonder where the fire was. Back in the kitchen, over 90 minutes later, the machine was still earnestly running its 15 minute pre-rinse cycle. A less sharp mind may not have noticed that there was something amiss, but my razor sharp mother realised that 90 minutes is far longer than 15 minutes and the machine had had plenty of opportunity to sort itself out. It was promptly switched off and a swift phone call made to Currys, who advised Mother to call the manufacturer. Reduce customer effort at every opportunity and take responsibility. Why is the vendor expecting the customer to do the run around? Why don’t Currys own the situation and just do it? Mother was more than a little miffed at the suggestion she call the manufacturer. In true Mother Dearest style, she hopped in her car and went straight over to Currys to take her vengeful rage out on the first hapless body in a Currys uniform she came across. Discussions (I use the term loosely, I suspect it was fairly one sided; think Attila the Hun meets skilled diplomat, she’s faultlessly polite and utterly terrifying) were had, Mother explained the unfortunate situation and the customer service agent in store agreed (there’s nothing else to do when faced with a livid Mother) that it was not acceptable. Phone calls were made and after a lot of fuss, it was agreed that the Know How guys would call Mother back to arrange a visit. On the Wednesday, Know How called to discuss the issue. They had no knowledge of the case which necessitated a recap from Mother – way to go! Why not kick the hornet’s nest? Communicate! If your business has to deal with complaints, make sure the agent that has to speak to the customer has all of the information to avoid the customer having to recount it – it just increases frustration. I suspect after the agent on the end of phone removed the flea from their ear, they were able to get on with their job. They promised to get back to her. No word by close of play on Thursday. Mother returned to the store, once again, on the Friday, a whole week from the first point of contact, to ‘discuss’ the ongoing situation with the agents in the shop again. Everyone she spoke to in store was wonderfully helpful, but their hands were tied by poor policies and the creaking machinery of an organisation too big to help. They offered to send an engineer at the weekend to fix the machine. This was declined and they were told in no uncertain terms that they would collect the faulty machine from the property and provide her a refund. This is not within Currys’ policy, since they prefer to fix than refund. I’m not sure the store staff were brave enough to have this argument and so they agreed that they would refund on this occasion, but that Mother would need to return to the store the working day after the machine was collected as they couldn’t issue a refund without the manufacturer’s approval. Why on earth should a customer have to return to the store for a refund? Just because company policy states that refunds won’t be given until the manufacturer had authorised it, doesn’t mean you have to live to the letter of the policy. In cases like this, take a little initiative and make life easier for the customer! On the Saturday, the chaps from Know How (is anyone else cringing at the choice of name by now? They clearly don’t all ‘know how’….) arrived to look at the machine. Upon opening it, it was clear that Laurel and Hardy hadn’t removed all the packaging. There was still polystyrene in the upper runners and plastic inside the machine. No wonder it wasn’t running properly! They pulled the machine out to find that Laurel had cross threaded the brand new valves and they were stuck on the machine. Laurel’s sharp exit now seemed to make a bit more sense. I suspect he knew he’d botched the installation and that’s why they didn’t want to hang around. Do I really need to point it out? If you’re going to do it, do it properly, don’t break it. The outcome? Mother Dearest will never darken the doors of Currys’ ever again. The common themes? Effort, Expectation, Ownership and Empowerment. It seems to me that Empowerment is one of the most important here: Empower your staff to make the RIGHT decisions for your customers. Don’t tie them up with policies. Policies are there for a reason, to protect the business, but allow your staff some autonomy to make the best decisions for your customers in these cases. The staff all agreed in store that the situation was awful, but felt that they could do little about it. Effort: Take the Customer Effort on where you can, so you bear the burden, not your customer. Ownership: Manage out the “not my job” culture and encourage and reward initiative and staff who want to please. Expectations: If you can’t exceed them, manage them! Having said all of this, I struggle to do each of the above in my job as a Customer Experience Manager for a large company, so I have some sympathy for Currys. Not least because they had to deal with my ferocious Mother, but surely there are some simple lessons we can all take from the above? Do your staff feel confident that they can ‘go rogue’ if they need to? Do your policies tie the hands of your staff? Do your staff own customer issues? There’s lots to think about and I’ll certainly be looking at my own company’s processes with fresh eyes. Perhaps Currys should do the same. Thank you for reading.